We are pleased to present the schedule for 2017, our 14th season of operating international racing trips. As always, the itineraries are designed for easy extension, either before or after the scheduled dates, for those who are wanting a longer stay abroad. The Ireland and England itineraries have built-in one-day options to extend, Ireland at the end of the trip, England at the beginning. We hope you will find one or more of our 2017 trips appealing. Please don’t hesitate to call or email us if you have any questions or if you would like to be listed to go on one. We look forward to hearing from you and to going racing with you this year. 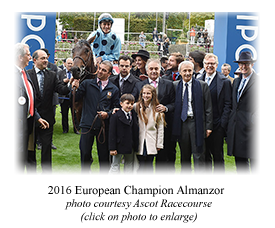 Irish Champions Weekend, which includes ten Group races (Five at the Group 1 level), has in its brief existence become one of the major events of the year in Europe. Its timing on the calendar allows us to also experience the one-of-a-kind beach races at Laytown and racing at two other atmospheric Irish courses. Included will be morning training on The Curragh, a visit to one of the most successful private studs in the world, and some interesting sightseeing on our way to the races. We'll lodge in the brisk seaside air at Malahide, north of Dublin. Champions Day is the British equivalent to our Breeders' Cup -- with title tests at six, eight, ten, twelve, and sixteen furlongs. It's the final major event of the European season and the richest day of the year in the U.K. Amid the bracing weather and radiant fall color we'll also cast a wide net over the English racing scene with days at Windsor, Bath, and Brighton, and make time for non-racing exploration of all three places. 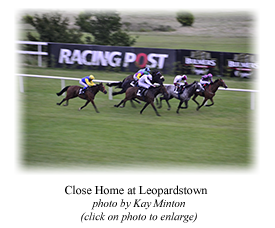 We'll top things off with a training visit to the "Valley of the Racehorse" in Lambourn and a Thames River cruise. Come a day early for more racing at beautiful Goodwood. 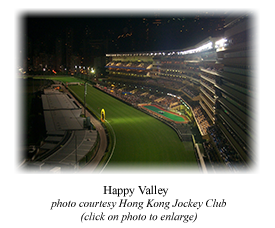 The biggest racing day of the year in Asia -- the Hong Kong Jockey Club's International Race meet at Sha Tin -- is the main attraction on our first visit to this fascinating city. We'll have an evening at the legendary Happy Valley course, see some morning training, and offer a variety of activities on land and water as we survey one of the planet's truly unique places.